Element is a multifunctional one page HTML template, suitable for company portfolio, showing your web or mobile app or simply a short brief. 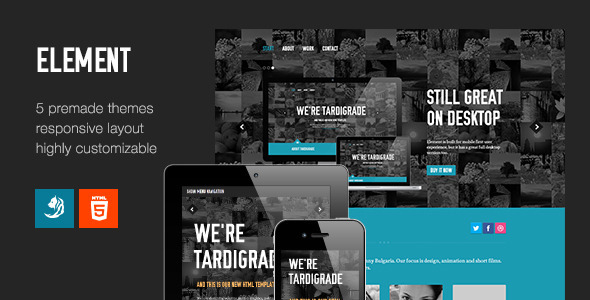 It’s responsive and looks great on phones and tablets and most of all it’s highly customizable. If you like this template, please rate it. You could also share with us what you’ve with the template, so we can post it here and show it to the others. Websites built with Element are going to be listed here. Please send us links and we’ll include the best ones here. With Element you can move every main and change their position the way you like. You can check out some of the elements available on the features page here. Element is based on LESS, which is deeply integrated in the color settings of the template. You have several color variables easily changeable through the main.less file which enable you to change the look of the template completely with a few alterations. Please read Documentation’s licensing part for the licenses of all external items used in the template. Please use the contact form on our profile page to get in touch with us.